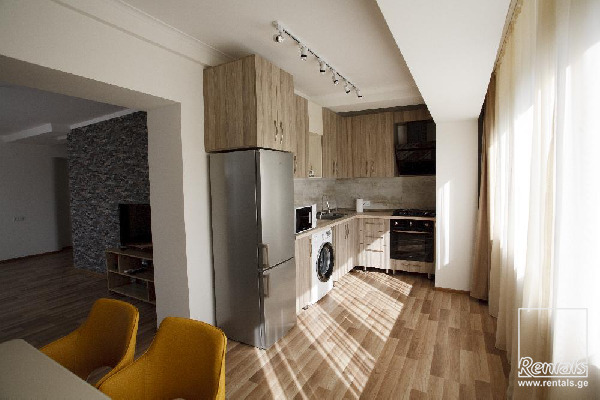 Top floor bright apartment with panoramic views is located in a very center of Tbilisi. Apartment is surrounded with lot of cafes, restaurants, fast foods, 24/7 grocery, 24/7 pharmacy, 24/7 exchanges, ATM, shopping malls, banks, tourist agencies, hospitals, parking places etc. The bus stop is literally a step away from the apartment building, also a metro station is in three minute walk. Apartment offers 2 bedrooms (one with a queen bed), plus one sofa bed in a living room, 2 bathrooms and balcony with a view over a main street. Apartment is equipped with a various home appliances, fast WiFi internet and FHD LED TV with more then 150 TV channels which guarantee a comfortable and careless stay. In a backyard of a building there is a basketball stadium and and a several play zones for children.